This is a busy time of the year, trying to get that last little bit of vacation time in before school starts or just busy keeping up with the yard and garden. There are those day when it is nice to be able to put something in the Slow Cooker and have it ready for a meal at the end of the day. This recipe for Slow Cooker Shredded Beef is great for the busy day, a covered dish or a game day party. A big plus for this recipe is it freezes well, and is limited only by your imagination. 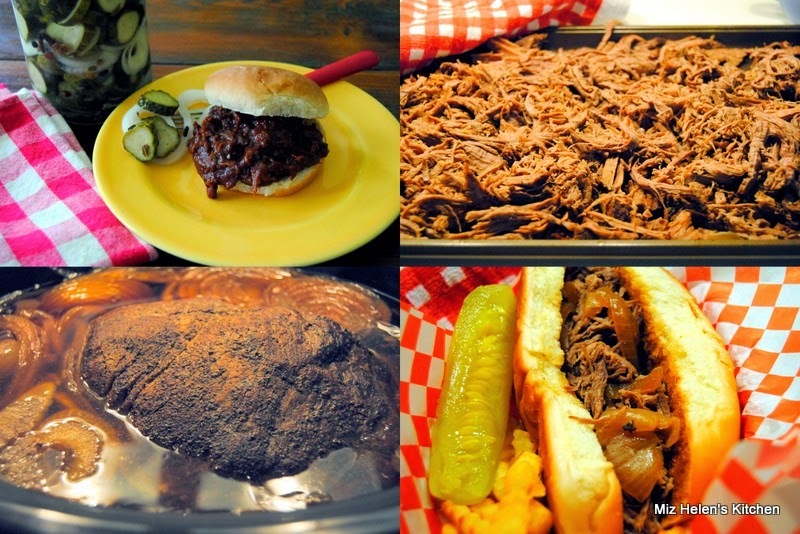 The variation that I am sharing with you today is a French Dip Sandwich and A Bar B Que on a Bun with a homemade pickle of course. Cut the onions in slices and place the onion slices in the bottom of the Slow Cooker. Place the onions on the bottom of the Slow Cooker and turn the Cooker on high. Sprinkle the minced garlic over the onions. Mix the salt, pepper and cayenne together and rub the mix over the entire roast. Heat the Olive Oil in a very hot skillet and sear the roast on all sides. Place the roast in a hot Slow Cooker. Pour the beef broth, soy sauce and Worcestershire Sauce on the sides of the roast around the edge. Cook on high for 1 hour, turn to low and cook on low for 6 1/2 hours. Take the roast out and shred the roast with a fork. Use the Au Jus (the liquid gravy left in the slow cooker) to dip the French Dip Sandwich or to moisten the meat. Butter and Toast Sub Rolls, place onions on the base and meat on top with more onions. Use the Au Jus to dip the sandwich. Mix the meat with your favorite Bar B Que Sauce. Serve the Bar B Que on a toasted bun. These are two of our favorite ways to have the Slow Cooker Shredded Beef and sure hope you enjoy the recipe.It is always good to spend time with you and thanks so much for stopping by today. Hope you have a great week and come back to see us real soon! This shredded beef recipe looks scrumptious! I love French dips, so I'll have to try this out soon!! This is my first time at your blog and all your food looks like what I grew up on, and that is a high compliment! ;) I'll be back again.